A Christmas concert of classic festive carols with a gospel and soul twist, featuring Beverley Knight, Carleen Anderson, Ola Onabule, Bryn Christopher and the Golden Gate Quartet. 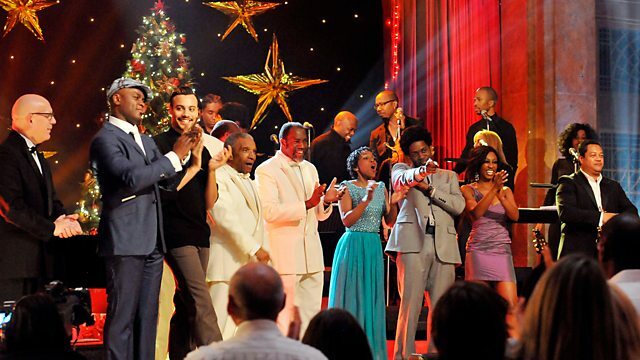 Browse content similar to Soul Noel: Gospel and Soul Stars Sing Christmas. Check below for episodes and series from the same categories and more! Soul Noel is a different kind of take on Christmas carols. It's just a lovely festive kind of experience. Soul Noel is chock-full of soul. It's something quite unique and quite bespoke for Christmas. People can expect a lot of pizzazz. A fantastic new arrangement of Christmas songs that are well-loved. These funked-up, grooved-up, soul vibe, reggae, ska monsters. It is Christmas, but with a big hug. Thank you so very much. Thank you. OK, I can feel it now. # Tell me, baby, do you recognise me? and so glad y'all could come. Hm! Come on, come on, come on! Little drummer boy. Hey! Come on, come on, come on! Yeah, let me hear you, everybody. Let me hear you, drummer. Come on! Make some noise! # Oh tell me, when was Jesus born? # When was Jesus born? # Tell me when was Jesus born? # Oh tell me now, when was Jesus born? # My brother, how will I send thee? # My brother how will I send thee? -My brother, how will I send thee? # That's born, born, little children, born in Bethlehem. But now we would like to continue to sing a song for you. I don't know if you remember the words or not, but... What are we going to sing next? -I Want To Be Ready. -He wants to be ready, I want to be ready. We all want to be ready to walk in Jerusalem, just like John. # Oh my brother do you walk on the thorns? Thank you so much! Thank you to Soweto Kinch. this amazing choir and fantastic band. whose arrangements you've been listening to all night. to Mr Kevin Robinson on trumpet! of Mr Ola Onabule. Come on! without the support of a phenomenal band. if we didn't have these astounding voices behind us. while they sing for you, We Wish You A Merry Christmas. Subtitles by Red Bee Media Ltd.
A Christmas concert with a difference, as carols, Christmas anthems and the odd pop classic are performed with a gospel and soul twist. Warm yourself on a winter's night with gospel, soul, reggae, ska and soca versions of classics such as Silent Night, Hark the Herald Angels Sing, Jingle Bells, God Rest Ye Merry Gentlemen and many more. Filmed at the Porchester Hall in west London, it features UK soul diva Beverley Knight, the multi- talented jazz blues soul singer Carleen Anderson, Lagos-born jazz soul singer Ola Onabule and Birmingham-born Bryn Christopher in a unique celebration of Christmas. Special guests include the legendary original Southern Blues-singing Golden Gate Quartet, a truly radical jubilee quartet, bringing the swing and groove of jazz into gospel music. Formed in the 1930s, the group still feature two original members. MD Ken Burton leads a stellar choir featuring a range of other top vocalists, all backed by a sizzling soul band.